Our first full day trekking in the Fan Mountains did not disappoint! They are more beautiful and more interesting than we could have imagined. I feel especially lucky having just come from Mount Elbrus on Berg Adventures annual climb standing on the top of the highest summit in Europe not long ago, now I find myself in Tajikistan in one of the most remote and wild and interesting ranges in all of Asia. We got a leisurely start from our beds in our cabins this morning to begin our trek. Our staff had a lot of organization and provisions to do and we’re loading them on what we call Tadjik taxis, or balkies. We have a group of seven Uzbek and one Russian accompanying us on this trek. They are all great people. In addition, a lot of local Tadjik people are helping us out as we move through the mountains. One of the people on our staff I’ll mention right away is Fyodor, who is a wonderful, very experienced Uzbek guide, always explaining things along the way: natural history, culture, geography, mountaineering lore. He’s always talking and explaining. He speaks no English, but Dennis, one of our young Uzbek guides, who speaks perfect English is always at his side and he’s saying “Dennis, tell them this, Dennis tell them that.” And we’re learning a lot from Fyodor who’s really an excellent guide. Another staff member who’s really important I should mention is Sophie, our cook. She prepares wonderful meals, fresh salads, a lot of really good nutritious foods that’s going to help us with our climbing and she’s a strong woman who smokes up the trail well ahead of us, listening to her Ipod and running ahead to make sure the next meal is prepared well. We’re really glad Sophie is with us. We climbed 2,000 feet right off the bat today, the group did really well by the way. Before lunch, we crossed a pass at 9,300 feet. 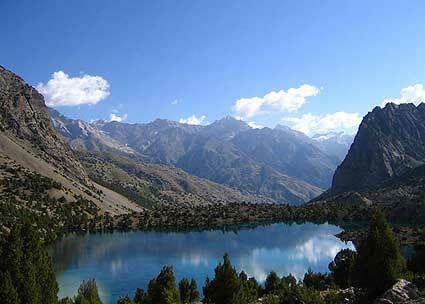 We had lunch in a beautiful turquoise lake, the first of the famous turquoise green lakes in the Fan Mountains. It’s really a beautiful stop. After lunch we stopped and visited a Tadjik shepherd family: an old man, his granddaughter and his wife who were living a simple life in the mountains. They were really pleased to show us their Yurt, which unlike the big Yurts we’ve seen in the desert is very simple, covered with quilts but they had a beautiful comfortable campsite where they spend the entire summer. They were wonderful people and we enjoyed visiting with them. Now, we’re about at 9,500 feet at another beautiful lake and we’re establishing our first camp. Sophie is getting ready to make tea for our afternoon snacks, and the sun is getting low in the Tadjik, Central Asian sky and I think it’s going to be a very beautiful evening. We’re all feeling great.